Aging and bulging of the gasket of the windshield is a known problem and the domestic and foreign cars. To fix the problem easily, you don't even have to visit the service station because of this little thing. With the damage of the seal windscreen motorists face, after his unsuccessful replacement or due to aging and drying. Rubber gasket can be squeezed partially or fully, in most cases this phenomenon occurs due to poor installation. To change the seal you need with wear and tear. If it dried up or sometimes it has lost integrity, you will need to pay close attention to the defect. Access to the place of work open: do not need to remove the hood or instrument panel, and the procedure itself will take about two hours, so that replacement of a sealant to the car wash not necessary to go. To change the seal the edging of the windshield better at home, but only if there is a garage or carport at the time of work will require a safe shelter from the rain. Will need a set of Phillips screwdrivers of different sizes, a pair of stationery knives, plastic putty knife, solvent for nitro paints and special sealer. Regarding the last point it is impossible to give any recommendations, as the range of adhesive sealants are quite diverse. In addition, you may need a unique tool for use in a specific make of car. First you need to remove all the decorative items: a plastic or metal corners, frames and other decorations. Not be amiss to remove the wipers to not interfere. The seal to pry in one place with a thin screwdriver. If there is a joint, it should start with him. When managed to liberate of about twenty centimeters, you can gently pull with a little force: the sealant itself will be released from the groove, even if sits very tight. 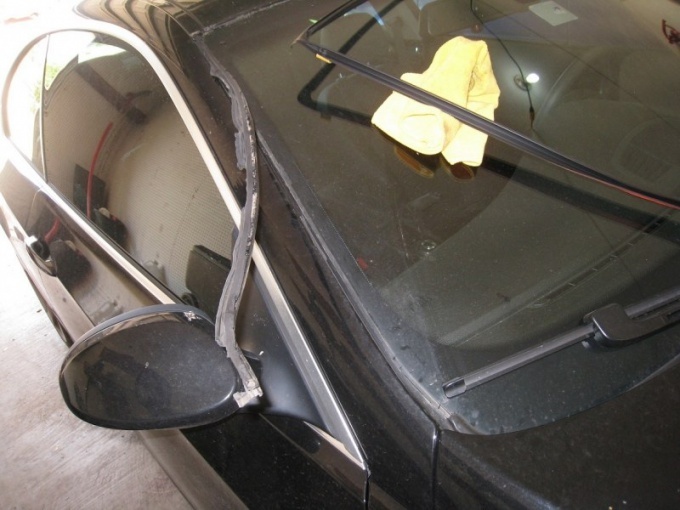 If you previously used a special glue for fixing rubber on the edge of the glass and the grooves, the windshield should be removed completely. For removing the windshield is better to go to the car wash: there it can be removed quickly and for a modest fee with the help of strings or other tools. If you decide to make the work in your garage, you need to prepare for long and laborious work. Glass is extracted from the seats with a plastic spatula and a broad screwdriver. One person squeezes the glass compartment side, and the other gently poddevat region. You should start with the top. After extraction, you need to thoroughly clean the edge of the window and landing groove. The latter should be covered with primer in several layers. After cleaning the surfaces must remain fragments of rubber or glue. With the installation of glass embedded in the lower groove, then you need to hold the insert around the perimeter. It is better to use cord or clothesline, thickness equal to the width of the deepest part of the groove. Cord need to soak detergent and evenly lay in the depression. As you insert the glass cord should be pulled out, so that the gasket is seated tightly and efficiently. The gasket can be additionally xed with adhesive-sealant. When the installation is complete, you need to draw the glass to the roof and sidewalls of the strips of adhesive on one day, and after their removal, you can return to the place of decorative lining.